From the BBC. Some great clips of the show, cast interviews and clips of James Herriot! What ever happened to Brian Nettleton, who the Calum Buchanon character was based on? I’m pretty sure he and his family moved to Nova Scotia, Canada and then later to Papua New Guinea. Dr. Nettleton ran a successful practice in Truro, Nova Scotia until the 1970’s or early ’80s. He and his wife moved to New Guinea. Unfortunately, he was killed during a snow storm during a visit to Nova Scotia. The date of his death escapes me. His widow now resides in Cape Breton Island that is part of the province of Nova Scotia. According to the prologue in Anne Barclay Priest’s memoir, Mr. Nettleton died just before Christmas 1988, in what she termed a “stupid automobile accident.” She dedicates her book to him, as a friend and as the mentor who turned her caprice to raise sheep on Blue Island, Nova Scotia, into a true shepherd’s life. Ms. Priest is recognized by the Blue Faced Leicester Union of North America as an early adopter of the breed, which was introduced to Canada and the U.S. largely through Mr. Nettleton’s efforts. Brian lived in Mendi, Papua New Guinea in the 1980’s when my parents worked there. I can remember Brian playing the spoons with my mothers solid silver desert spoons at dinner once, we still have them and they are still slightly dented! I don’t know the exact details of the work Brian was doing but have vivid memories of visiting their place and sitting on the veranda while Brian worked sheep and ducks on the far side of the small valley with a dog. Not someone you could meet and ever forget, a true character. 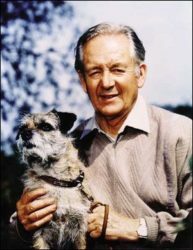 Previous PostPrevious Is James Herriot the Best Animal Author?